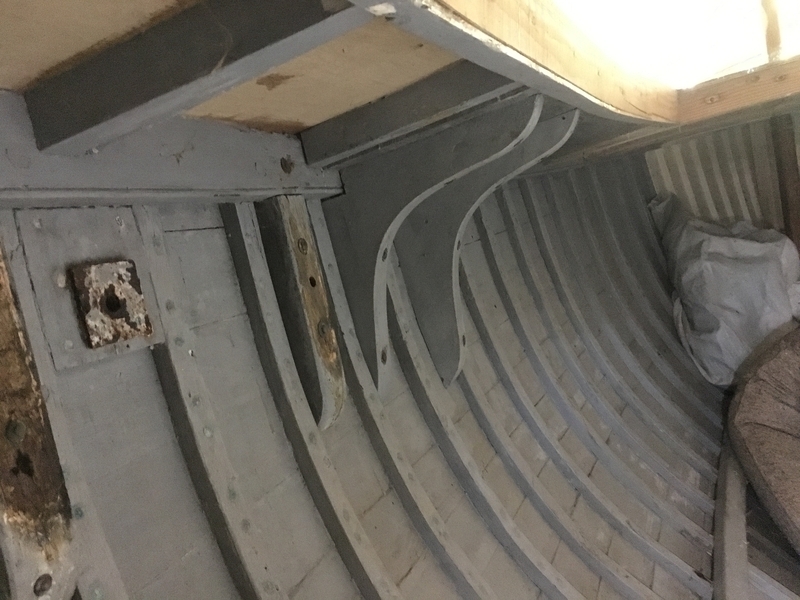 'Frisky' Burmudian Cutter - This craft was the subject of a rebuild and is a bare hull in good condition and ready for completion with all equipment carefully stored. This is said to be the sister ship to the boat 'Nancy Blackett' from 'Swallows and Amazons' - it is identical apart from having white rather than red sails. The owner has undertaken substantial work - he reports "I stripped the boat back to the bare hull. All possible reusable woodwork was laid aside and stored. I dropped the iron keel and replaced the keel bolts, professionally made 7/8" dia. with forged carrot heads. The skeg was renewed in teak. All paint was removed from the interior, six cracked ribs were replaced and the whole repainted. A sub deck of marine ply has been laid and a new sampson post fitted. New engine bearers were constructed with new engine mountings. Sadly at this point it was necessary to place the rebuild on hold and the vessel has been stored on a twin axle road trailer and covered with a heavy tarpaulin. The craft is in good order for the rebuild to continue with a new owner and bring this beautiful craft back to its full glory. The boat is complete with mast, booms, a full set of sails (mainsail was new and only used once), anchors and chains, winches, pumps, controls, brass port lights etc. The proprietary manufactured trailer after some years of standing requires repainting and would benefit from an overhaul.